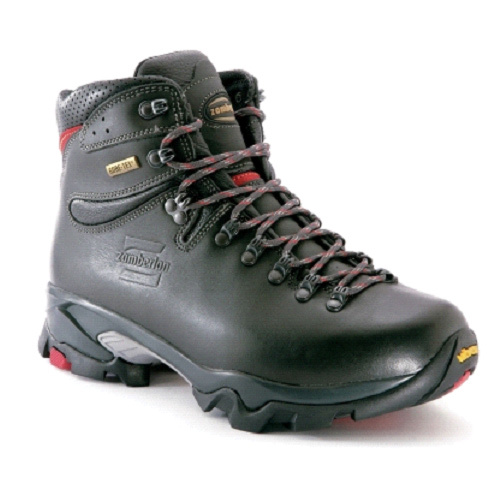 Exceptional boot for extended backpacking, long trekking, and four season hikes. Zamberlans best-selling boot, the 996 Vioz GT is a tribute to Italian comfort, performance, and design. Discover why this is one of the best reviewed boots in the outdoor industry worldwide! Now available in wide sizes. A Zamberlan Hydrobloc full-grain leather upper with straight-forward and effective design sits atop an exclusive Zamberlan Vibram 3D outsole providing excellent grip, superb downhill braking, wide lugs for easy debris removal, and an energy producing, rock-forward motion. As with all Zamberlan soles, the Zamberlan Vibram 3D soles are re-solable. Gore-Tex Performance Comfort membranes provide the utmost protection and breathability while the Microtex wicking nylon collar lining helps control excess moisture around the ankle. The ZFS (Zamberlan Flex System) allows the boot to very comfortably flex forward without compromising support laterally.